Content marketing is impactful when delivered at the right moment with the right message. In other words, creating a content piece late and last-minute will likely get skipped over. 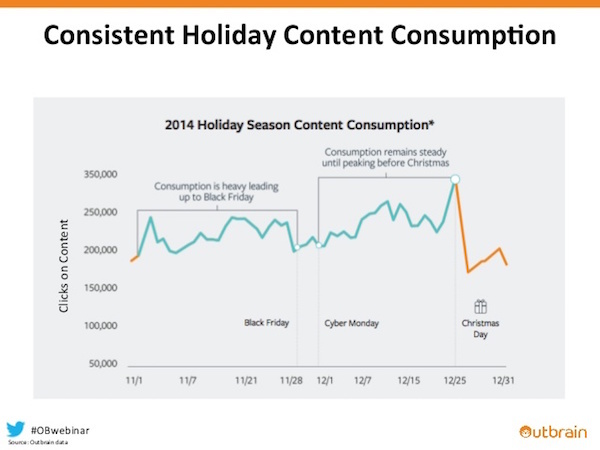 So when is the best time during the holiday season for content marketing? Outbrain recently dove into the analytics of our Christmas shopping habits, strongly focusing on our consumption of content marketing from Halloween to New Year’s Eve. As you can see, clicks on content marketing significantly (and consistently) spike throughout November until Cyber Monday. Then clicks drop and are on a slow incline with a prominent peak during the second week of December. After Christmas Day, it’s as if the world has forgotten the Internet exists. More and more shoppers are purchasing holiday gifts before setting the Thanksgiving table. That means we as content marketers need to get in the game sooner. The best time to publish your holiday content marketing is during November before Cyber Monday. If last-minute shoppers are your target audience, then you can make the second week of December work in your favor. If you’re reading this blog post now, you’ve missed your chance for the best impact on your content marketing. Unless, of course, you can scramble up something quick in the next 24 hours. Creating holiday-related content marketing must be delivered at the right moment and target your shoppers’ most pressing needs in order to be effective. But like holiday cheer, being ready to deliver holiday content is something you can do throughout the year! Take a close look at your customers’ buying habits during Q4. What common patterns stand out? What questions do they frequently ask? Where in the buyer’s journey do they get stuck the most? This way, you know the best topic and form of content marketing to create for the holidays. Mark the publish date on your editorial calendar. Add monthly (if not weekly) reminders as far out as four months in advance. If you want to create effective holiday content marketing, it needs to be on your mind early. This allows you to see how your content idea can tie into your overall marketing strategy. The rules of the digital marketing space quickly change, and a lot can happen between now and next fall. That way, if there’s a shift in SEO algorithms, social media practices or even internal company structures, your strategy still doesn’t miss a beat. Even if you can’t be an active voice in this holiday’s content marketing scene, you can still be an active listener. Review the different kinds of content marketing being published and promoted by others in your industry. What works? What missed the mark? How can you apply (without downright stealing) these tactics to your content marketing next holiday season? The best gifts are personalized and thoughtful. And with the right approach and planning, that’s something you can give to your customers. What do you think? When is the best time for holiday content marketing? Share your strategy below.